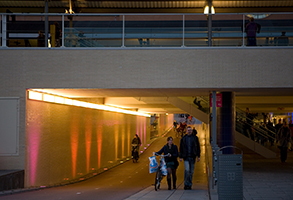 Seesaw is an installation made for a new bike and pedestrian tunnel under the train station in Hilversum. 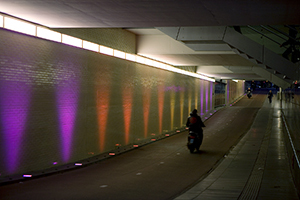 In the 100 meter tunnel, lamps have been installed sequentially in the ground, projecting conical beams of light onto the adjacent walls. 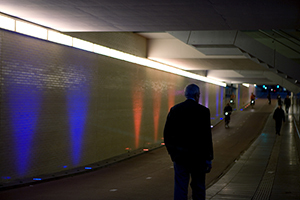 Movement sensors are employed to enable the lamps to respond to the presence and movement of the passersby. 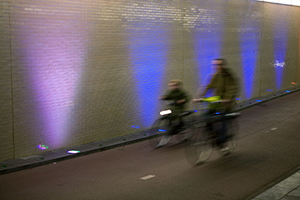 The number of lamps which are ignited increases in relation to the amount of pedestrians and bikers traversing the tunnel at a given time. The light swiftly travels across the tunnel, jumping from one lamp to the next, accompanying the traveller on his journey. 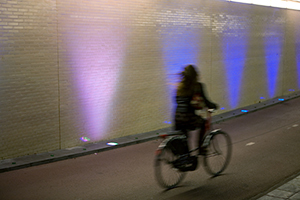 When the tunnel is empty a single furtive light always wanders up and down, beckoning those who arrive in order to accompany the next passerby. 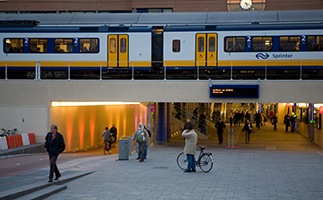 The tunnel runs under the train track connecting an underdeveloped urban area with a considerably more well to do sector in the centre of town. These two distinct regions are separated geographically by the edifice of the station. Now with the construction of the tunnel they have been directly connected for the first time. The work tries to emphasize, albeit in a light hearted way, the particular relationship between these two very distinct living environments.